Excerpt from “The American Locator”, in The American Locator by Underground Focus. Video clips by Planet Underground TV. 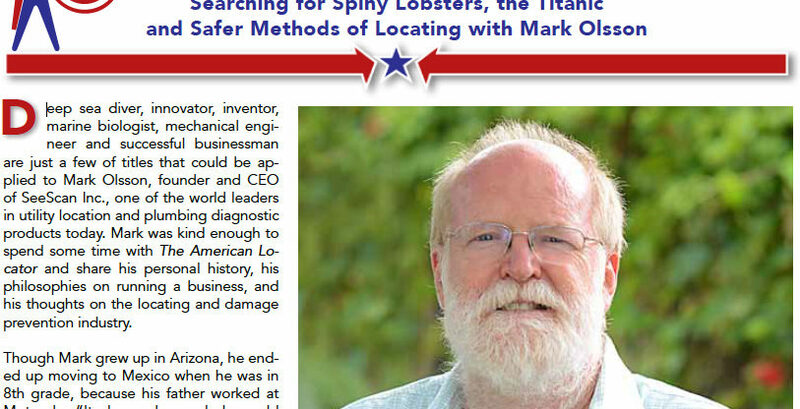 Deep sea diver, innovator, inventor, marine biologist, mechanical engineer and successful businessman are just a few of titles that could be applied to Mark Olsson, founder and CEO of SeeScan Inc., one of the world leaders in utility location and plumbing diagnostic products today. Mark was kind enough to spend some time with The American Locator and Planet Underground TV and share his personal history, his philosophies on running a business, and his thoughts on the locating and damage prevention industry. Realizing that there were no reliable, water proof power solutions for underwater lights, he and fellow scientist Ray Merewether created the SeaBattery, and not wanting to get bogged down in the politics of academia and grant proposals, Mark then created his own company DeepSea Power & Light to focus on making these products. This led to exploring the darkest recesses of the ocean, from the Marianas Trench to working on locating the wreckage of the Titanic. This allowed them to develop underwater lights and cameras that were used for the IMAX Titanic movie, which inspired director James Cameron to make his smash hit film Titanic. Thus in 1994 the SeeSnake was born, a revolutionary sewer camera that changed the plumbing industry forever and is still used today. A year later they partnered with the Ridge Tool Company for global distribution, and have maintained a close working relationship with them for over 20 years. Check out more on this story in the current preview version of The American Locator.